The film opens on the Turkish Railway, 400 miles from Istanbul. 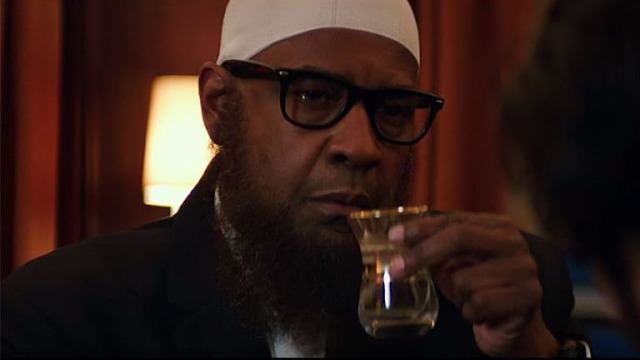 Robert McCall (Denzel Washington) enters the bar cart of the train and has a drink with his target, a Turkish man (Adam Karst) who has kidnapped his daughter from her American mother just to spite his ex-wife and hurt her. When the man becomes aware of McCall's mission, he orders his men to take care of him. McCall surveys the room, sets his timer, and proceeds to punch, smash, stab, and neck-snap all the goons. He approaches the father and gives him a chance to take the easy way out. In Boston, the mother, Grace (Tamara Hickey) goes to the office of her lawyer where her daughter is waiting for her. She tearfully embraces her little girl. McCall now works as a Lyft driver, with his most frequent driver being an elderly man named Sam Rubenstein (Orson Bean). Sam is in the middle of a case to try and locate his long-lost sister. McCall often interacts with some of his passengers while observing others. One night, he is told to take home a young woman named Amy (Caroline Day), who has been drugged and possibly raped. McCall takes her to the hospital and returns to the apartment of the guys who assaulted her. After telling them to do the right thing, the leader of the punks tries to hit McCall, but he uses the guy's card to cut him before breaking his and his buddies' bones before leaving. In Belgium, a man, Mr. Calbert (Antoine de Lartigue), comes home to find his wife beaten and crying. Three men - Resnik (Jonathan Scarfe), Ari (Kazy Tauginas), and Kovac (Garrett Golden) - emerge and shoot the wife in the head. They then force Mr. Calbert to sit down before Resnik forces a gun into his mouth and pulls the trigger. McCall finds that one of his neighbors, Fatima (Sakina Jeffrey), had her garden vandalized, and the walls have been sprayed with graffiti. McCall starts to wipe it off before he is met by Miles Whittaker (Ashton Holmes), a young man who frequently interacts with McCall and is an aspiring artist. Miles offers to help McCall take it down at a price. McCall goes to the book store to find a new book her ordered, and he sees that the clerk is Grace, and her daughter recognizes him, but Grace doesn't know McCall was her savior. 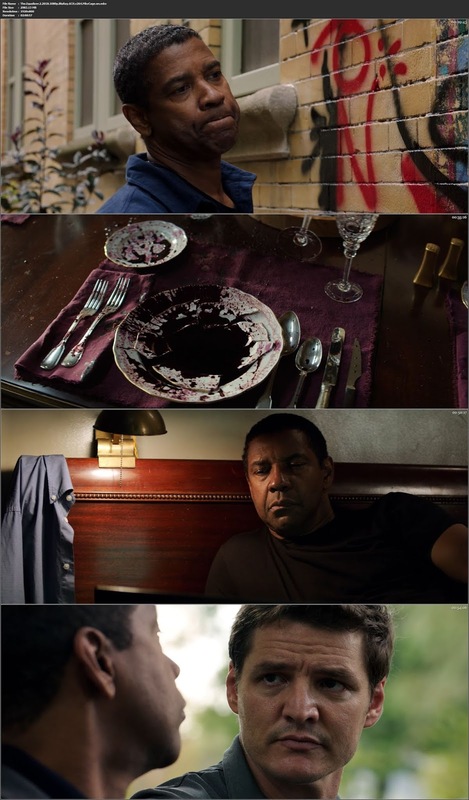 When he gets home, he finds Susan Plummer (Melissa Leo) already there, and they share a friendly dinner. Susan forgot that it was the day of McCall's late wife Vivian's birthday, and she suggests that he get out there more. Susan later talks to a colleague, Dave York (Pedro Pascal), as they investigate the murder of the Calberts. They fly out to Belgium to investigate the crime scene. Susan goes back to her hotel room where she is followed by two thugs that attack her. They start yelling about money, but she puts up a good fight and holds them off before they attempt to corner her in the bedroom. McCall is watching Miles paint the wall when he gets a call from Susan's husband Brian (Bill Pullman) to inform him that Susan has been murdered. McCall flies out to Washington DC for the funeral and later starts to investigate Susan's death by reviewing camera footage from the hotel, as well as crime scene photos. The thugs are in their apartment blasting music when they hear a phone ring. It's not coming from either of their phones, so they end up finding another phone on the floor. When they answer it, their radio explodes, killing them both. Outside, Resnik and his buddies watch, having taken care of them. McCall finds Dave, who believed McCall to be dead. They have learned about the killing of the thugs, and McCall determines they were just loose ends that needed to be taken care of, and that Susan's death may have been connected to the Calbert murders. McCall observes Miles going out with two neighborhood gangsters. He follows them to their apartment, knocks out their guards, and takes their guns to force Miles to come back with him. He was there because they were going to help him get revenge on the thugs that murdered his brother, but McCall makes it clear that he has no business dealing with these guys. McCall is driving a passenger who says he's going to the airport. He gets suspicious and intentionally takes the wrong route, and when he reveals this, the passenger tries to stab him. McCall drives around like crazy to knock the guy around as he manages to elbow him in the face repeatedly. The guy then tries to shoot McCall, but he grabs the gun and shoots him first. He takes the assassin's phone and finds coded information on it before he burns the car with the man's body inside. McCall takes Brian away to a safe house until he sorts this situation out, fearing that Brian may be targeted as a loose end. McCall takes the phone to Dave's house where he meets Dave's wife and two daughters. As they leave the room, McCall shows Dave the information on the phone and traces the source back to another phone...which happens to belong to Dave. He reveals that after he and the other men (who were all taught under McCall in the CIA) believed him to be dead, they got involved in some nasty business, and when Susan nearly found out, Dave killed her himself. Dave takes McCall outside to "reunite" with Resnik, Ari, and Kovac. He vows to kill them all for what they did to Susan. McCall is then given a ride by Dave's wife, as if to taunt him. Miles is at McCall's apartment painting the wall for him. Dave and Kovac attempt to break into the apartment, just as Miles is on the phone with McCall. He orders Miles to find a secret hiding spot behind his bookshelf, and he goes there, but Miles starts to get claustrophobic. McCall calls Dave before he finds Miles and tells him where they can find him. As Miles thinks he is free to go, Dave kidnaps him at gunpoint. McCall heads to his old hometown as it is being evacuated due to a hurricane. The four villains scour through the town to find McCall. Kovac goes into a shop where he thinks he spots McCall, only for McCall to shoot a harpoon through his head. Ari then goes after him, but McCall catches him first and slices him up and down his whole body. Resnik follows McCall through another shop, and he gets blown up by a grenade, causing his stomach to burst open. Dave is left at the top of a tower trying to snipe McCall. He manages to contact him and tell him that Miles is stowed away in a trunk, and Dave will kill him if McCall doesn't surrender himself. He fires several taunting shots, but once he gets to his last shot, McCall shoots the tire of the car that Miles is in so that Dave can miss him. McCall then climbs to the top of the tower and faces off against Dave. He tries to stab McCall, but McCall is fast. He gouges Dave's eye out before grabbing his knife and stabbing him in the abdomen, and then he slices Dave's neck from the back before throwing him off the tower where he smashes against the rocks, and his body is swept up by the ocean. McCall goes to free Miles and sees that he got shot in his leg. He takes the boy to his old house where he treats his wound and stops the bleeding. Miles then sees pictures of McCall when he was a soldier, as well as pics with Vivian. Back home, Fatima sees that her garden has been restored, and a mural has been painted on the wall by Miles depicting what appears to be life in her old country. On the opposite wall is written "I leave you with the best of myself." We also see Miles on a bus talking to a girl from his school as she sees a drawing he is making, inspired by McCall. Sam is seen being reunited with his sister Magda (Gloria Papert) after McCall pulled a few strings. In the final scene, McCall is standing outside his old house, looking out into the ocean.